Families, relax at the beach in our well appointed, newly refurbished,, 2nd floor garden villa with cathedral ceiling, skylight, and wrap-around 3-Season porch, backing onto the trees. TV/ DVD in every bedroom; broadband wireless in unit. Villa is tennis-side, less than 1 mi. away from resort's 1/2 mi. private guarded Beach, and close to the fitness center and pools. All-inclusive gated resort community with walking/bike trails, complimentary shuttle throughout the grounds to resort's private, guarded beach and pools (10 outdoor, 2 indoor), tennis (34 courts/4 indoor), or Fitness Center. Kiddie camp, concierge services, water aerobics, tennis clinics. Nearby golfing or boating is available. Enjoy alfresco dining at the on-site Market Place or Tax-free outlet mall shopping in nearby Rehoboth. Living room & Master Br. have Hi-Def Blu-Ray players. Aerobics Classes, Basketball, Beach, Biking, Bird Watching, Boating Rental/Charter, Canoeing, Casino/Gambling, Fishing, Game Room, Golfing, Hiking, Horseback Riding, Ice Skating, Jet Skiing, Kayaking, Sailing, Spa/Massage, Surfing, Swimming, Tennis, Volleyball, Water Skiing, Whale Watching, Wind Surfing. toilet, shower, jetted tub, Master Br. Bluetooth docking player in Den. 1 King; 1 Queen; 2 twins; Trundle daybed in private study. Jacuzzi in master bedroom, screened porch. Wireless Wi-Fi; TV/ DVD in every bedroom, living room and Master Br. have Hi-Def. Blu-Ray player with NETFLIX availability; PlayStation-3 and IPod docking in study, video library; Tennis Center, Fitness Center with hot tub and saunas. We had a wonderful stay at this condo and would definitely recommend it. The condo was furnished beautifully, and we really appreciated all of the little thoughtful touches, including dishes not only for the adults but for children as well. The bathrooms were spacious and gorgeous and the bedrooms are very comfortable. We loved eating breakfast on the screened-in porch in the morning. The pots and pans provided for the kitchen were perfect. We arrived after the official end of the summer season so the tram service to the beach was no longer operating. The walk to the beach is a bit far (35-45 minute stroll along the path - and if you have a toddler it may take a bit longer!). Since the number of guests at Sea Colony decreases considerably after Labor Day, we would recommend driving to the Sea Colony East high rises and parking there to go to the beach. You should have no problems finding parking there after Labor Day. The outdoor pools are salt water pools while the indoor pool in Edgewater House is chlorinated. We had no problems with crowds in the pools and sometimes had the indoor pool to ourselves! 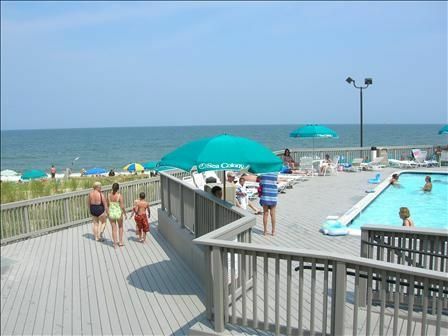 We thought that the pools were great and very nicely maintained, as was the entire Sea Colony property. We had a lovely time and hope to return soon. We are so glad that you enjoyed your stay! Our home is on the tennis-side of Sea Colony and we prefer the garden-style homes, with meandering bike paths and wooded walking trails, to the high-rises on the beach. Although we're less than a mile from the beach, the tram to the beach runs continuously throughout Sea Colony during the summer and takes you to our private, guarded beach with adjacent pools and associated restrooms, showers and saunas. As you note the tram stops after Labor Day, but there is plenty of parking at the beach-side Sea Colony high-rises in the off-season. I would rate my stay at the Condo as excellent. The owner has taken great pains to furnish it well. I was very impressed with the crockery and utensils provided. However I was a little disappointed with the swimming pools at the tennis resort, they looked rundown and in need of some major renovation. The swimming pools at the beach resort were very nice and well maintained. Thank you for your lovely comments about our house! We try to provide the comforts of home to our guests. We're glad that you enjoyed the pools at the beach. Sea Colony has 12 pools. At the end of the season, the less frequented pools on the Tennis-side are in the process of being closed. The frequented indoor pools at both Rec. Centers remain open and are maintained throughout the year. Sea Colony is also ranked among Tennis Magazines-- 50 Greatest U.S. Tennis Resorts, and the United States Tennis Association has named Sea Colony-- Club of the Year. protecting extensive marshlands along Chincoteague Bay. It has diverse and rich wildlife, including picturesque herds of wild horses. Activities include surf fishing, camping, back-country camping, wildlife, birdwatching and shell fishing. *DiscoverSea Museum- You will see hundreds of shipwreck coins, weapons and jewelry, colonial artifacts and ever changing exhibits. *Rehoboth Outlets- Shop more than 140 tax-free stores in Rehoboth Beach. *Salisbury Zoological Park- Free admission, but donations are accepted. Signers should be over 25 and occupy property. RECREATION & MANAGEMENT FEES ARE ADDITIONAL. LINENS may be rented upon request.